Researchers in Europe have created a soft artificial heart that mimics the real thing. It’s still not ready for prime time, but the approach, in which the developers used silicone and 3D-printing, could revolutionise the way patients with heart disease are treated. Patients with severe cardiovascular problems are typically hooked up to blood pumps while they wait for a donor organ or for their own heart to recover. But these machines have many disadvantages, including the possibility of mechanical breakdown, producing infections, and the formation of blood clots, to name a few. What’s needed in the interim is a device that more closely resembles the real thing, and that’s exactly what a research team led by Nicholas Cohrs from ETH Zurich has done. “Our goal is to develop an artificial heart that is roughly the same size as the patient’s own one and which imitates the human heart as closely as possible in form and function,” said Cohrs in a statement. The new soft artificial heart, now described in the science journal Artificial Organs, only works for about three-quarters of an hour, but it passed some critical tests in terms of its potential. 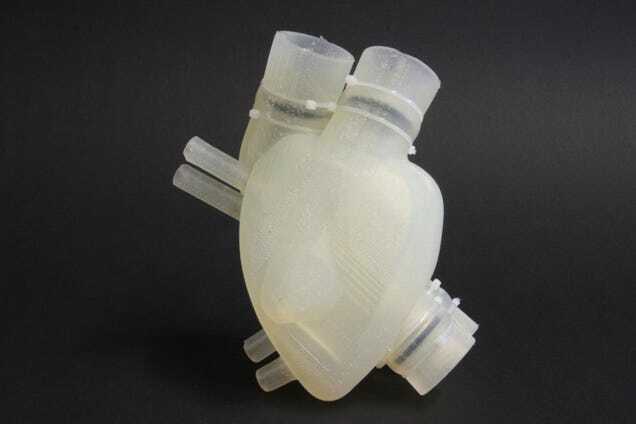 The soft artificial heart was manufactured from silicone using 3D-printing. It weighs 390 grams (the average human heart is about 310 grams), and has a volume of 679 cubic centimetres (a size comparable to the human heart). Like a human heart, it has a left and right ventricle, but they’re not separated by a septum. Instead, an additional chamber is used, which is inflated and deflated by pressurised air. This creates the pumping action, replacing the muscle contraction of the human heart. The researchers were able to evaluate the performance of the heart in a testing environment that simulates human cardiovascular systems. Using a fluid with the same viscosity of blood, the researches pumped the liquid through the artificial heart’s blood chambers. These tests proved that the system works at a fundamental level, and that the artificial heart moved in a way similar to the real thing. Unfortunately, the device only lasts for about 3,000 beats, which for an average person represents about 45 to 60 minutes of functionality. After this, the material can no longer withstand the strain and it starts to falls apart. But the researchers aren’t, ahem, disheartened. “This was simply a feasibility test,” said Cohrs. “Our goal was not to present a heart ready for implantation, but to think about a new direction for the development of artificial hearts.” Moving forward, the team will work to increase tensile strengths of the material, and improve its overall performance.